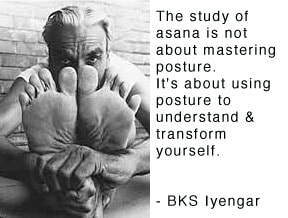 Iyengar Yoga is taught in the tradition of B.K.S. Iyengar, a yoga master. This method helps students to find a firm foundation in each yoga pose (called asanas) and according to their own capacity bring each part of the body into clear connection using the principles of alignment. Each yoga pose has a shape and integrity and gives certain benefits. Clear precise instruction helps students craft the pose and stay mindfully connected to the process. This safe, progressive approach brings increasing benefits over time. These include better balance, increased strength, flexibility and coordination, and the ability to concentrate and to relax and let go of the effects of stress. You do not have to be flexible or know anything to begin yoga. Poses are demonstrated each time with enough information to get you started.